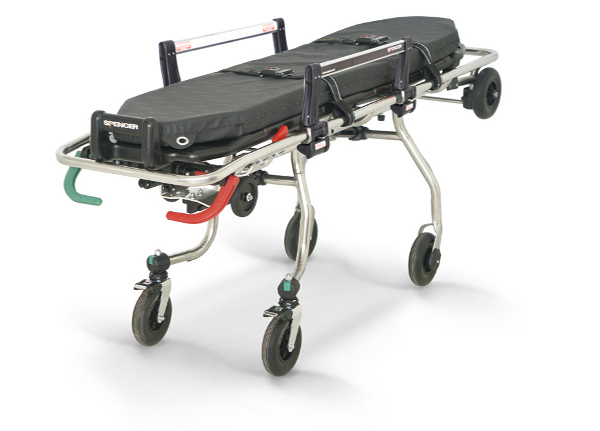 The Carrera Tec with its only 32 kg [70 lbs] is our lightest stretcher. 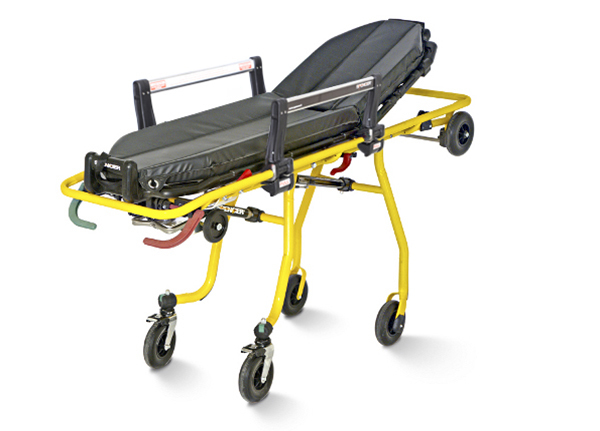 The self loading stretcher that combines solidity, stability and design. Two different loading levels upgraded with the loading level adjustment system that automatically locate the ambulance platform guaranteeing the stretcher complete safety. The suspension system helps improve the quality of the rescue while reducing the vibrations before they are transmitted to the patient. The frame is available in different colours painted with the epoxy powder paintwork that allows excellent results in terms of design and ecology. The synthesis of these characteristics is a high performing product, rich in standard features to satisfy the most demanding rescuers and the most sensible patients. The Carrera Pro, with space for the positioning of a spine board under the loading surface of the stretcher, turns out to be an excellent solution in International rescue scenes. The fixation is practical and is achieved when pressure is applied. The two different loading levels and the wheels completed with the loading level adjustment system simplify the loading onto the ambulance, while the suspension system, present in the posterior legs, reduces vibrations and noises before they are transmitted to the patient. Carrera Pro is available in different colours, with different configurations of the platform and with the exclusive Twist system that permits the rescuers to optimise the loading manoeuvres avoiding to overload the lumbar region. Here comes the new Carrera XL, the first Carrera that combines the stability and security typical of this category with the comfort and the convenience of a stretcher with adjustable heights. A complete and solid stretcher able to rewrite the parameters of excellence for its category. The innovative suspension system in the newly designed posterior legs reduces vibrations and noises caused by uneven ground before they are transmitted to the patient. This guarantees larger stability, more precise steering and smooth transportation even on rough ground. The product adapts to the many and specific needs of the International rescue. The Carrera XL is the highest of its family – it has variable heights arriving at a loading height of 800 mm [31 in]. This means that Carrera XL adapts perfectly to any kind of ambulance while guaranteeing a higher level of comfort to the rescuer. This model is also available with different configurations of the patient platform for the various antishock movements, all with the possibility to set the backrest in different positions. The light weight of the Tec and the 200 mm [7.87 in] wheels guarantee free movement with less effort without compromising the stability. I can't really say it was a nice journey, but the stretcher absorbed the bumps well and this boosted my confidence. Carrera 10G is concentrated reliability. It permits us to fulfil the requirements of many different types of customers. We were able to personalise our Tec by using our company colours. It makes the stretcher feel part of our team. During transport I was able to hold on tight to the armrests. A bit of comfort in such a nasty episode. Surveillance of International markets has always been our goal. With Carrera we are managing it without any problems. Having the spine board handy at all times guarantees better quality rescue and less waste of time. When you find yourself on an ambulance it's normal to feel nervous. Seeing that the devices are built also for patient comfort is a great help. The two different loading heights offer us the possibility to adapt to the requests of even the most demanding customers by adapting the stretcher height to different loading platforms. 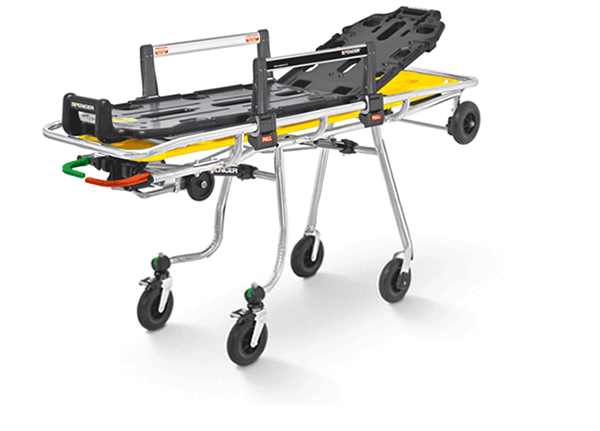 We chose Carrera Pro because it's a complete stretcher with high quality standards at a decisively competitive price. My pregnancy was initially at risk. I was very worried about the vibrations in the journey from home to the hospital but actually I didn't feel a thing... and neither did my baby! The Spencer stretchers need very little maintenance. This significantly reduces time and costs without taking anything from the safety of the vehicle. The loading height of up to 80 cm offers us the possibility to care for the patient in a more comfortable way. When they put my child on the stretcher I was terrified but then I realised that the stretcher gave him the necessary sense of protection and he wasn't worried at all. As far as I'm concerned it's the best device on the market. Our clients are all totally enthusiastic! We aren't super heroes. We are just people working for the ones in need. It's a difficult job but with the right instruments it all becomes a lot easier. I saw that on the ambulance all the products were Spencer brand. The journey to the hospital was not as traumatic as I had expected. Adjustable heights also for the Carrera. This is the reason we like to work with Spencer: constantly upgrading.